Chesham is a London Underground station in Chesham, Buckinghamshire. It is served by the Metropolitan line and is the terminus and only station on the Chesham branch, which runs from Chalfont & Latimer. The station is in London fare Zone 9 (previously zone D). The station was opened on 8 July 1889 by the Metropolitan Railway (MR). It is a Grade II listed building. 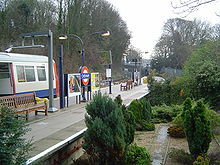 The distance between Chesham and Chalfont & Latimer is the longest between adjacent stations on the whole London Underground network at 3.89 miles (6.26 km), and Chesham station is 25 miles (40 km) north-west of Charing Cross, making it the furthest London Underground station from central London. It is both the northernmost and westernmost London Underground Station. On 16 and 17 August 2014 the branch line celebrated its 125th anniversary of operating. It was celebrated using London Underground's first steam locomotive, Metropolitan 1. It ran from Rickmansworth to Chesham (with the first and last service of each day starting or ending at Harrow-on-the-Hill to allow stabling of the set at Ruislip), meaning that the line from Chalfont and Latimer to Chesham had to be closed for a period of time to allow for the special service. The station was opened on 8 July 1889 by the Metropolitan Railway as the company's temporary northern terminus when the railway was extended from Rickmansworth. The line had been intended to cross the Chilterns and connect to main line companies serving the north. From Chesham the line would have continued north to connect to the London and North Western Railway's Euston-Birmingham line at Tring. However, before work was begun, the MR chose an alternative route across the Chilterns via Aylesbury. The line to Chesham was retained as a branch from the new route and construction began in late 1887. Although the MR continued to buy land between Chesham and Tring for some years after the station's opening, the route was never extended further. Ensemble value: the station building, signal box and water tower form an unusually coherent and intact group. The Chesham Shuttle on the last official day of operation at Chalfont & Latimer. Since 12 December 2010, Chesham has had an 8-car train every 30 minutes direct to London. In the morning and evening peak, trains run non-stop between Moor Park and Harrow-on-the-Hill, then calling at Finchley Road and all stations to Aldgate. During off-peak times trains now call at all stations to Aldgate. For Chesham residents this is a major improvement to the timetable, as previously Chesham was served in the off-peak only by a 4-car shuttle service to Chalfont & Latimer, where passengers had to change onto a train to or from Amersham. Although the reasons for the new service pattern were largely technical (the new rolling stock whilst designed as two four car trains for the 8 car units, and one four and one three car train for the 7 car units, cannot be split into four-car trains as they only have driving cabs at the outer end of each unit), it was expected to ease congestion on local roads by increasing Chesham's attractiveness to park-and-ride motorists. ^ The three track layout may be seen during the opening credits of John Betjeman's TV documentary Metro-land. ^ a b Hardy, Brian, ed. (March 2011). "How it used to be - freight on The Underground 50 years ago". Underground News. London Underground Railway Society (591): 175–183. ISSN 0306-8617. ^ "Key facts". Transport for London. Distances. Retrieved 28 October 2011. ^ Simpson 2004, p. 8. ^ Simpson 2004, p. 14. ^ Foxell 1996, p. 32. ^ Foxell 1996, p. 72. ^ a b Foxell 1996, p. 84. ^ Historic England. "Chesham Underground Station including water tower to south and signal box to south-east (1401704)". National Heritage List for England. Retrieved 19 August 2012. ^ Goodman, Camilla (17 November 2010). "Chesham shuttle to be replaced by direct trains next month". Buckinghamshire Advertiser. Uxbridge. Archived from the original on 7 October 2012. Retrieved 3 February 2011. ^ "Amersham and Chesham". TfL. Archived from the original on 15 August 2012. Retrieved 24 August 2012. ^ "Chesham and Amersham consultation on service improvements". TfL. 12 June 2008. Retrieved 24 August 2012. ^ "Consultation on proposed changes to Metropolitan line services at Amersham and Chesham" (PDF). TfL. February 2009. Retrieved 24 August 2012. Wikimedia Commons has media related to Chesham tube station. This page was last edited on 24 January 2019, at 12:05 (UTC).